A special Guitarist tribute to a special guitar hero. 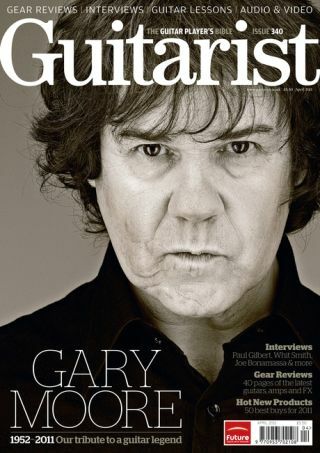 Gary Moore in his own words - choice excerpts from a a career of Guitarist interviews, memories from close playing friends including Scott Gorham and Bernie Marsden plus the essential Gary Moore albums. The bluesman talks about the making of his best album yet - Dust Bowl. Back with Mr Big and better than ever - Paul talks guitar. The truly incredible Western swing and jazz player gives insight into his style, gear and a guest lesson. The top 50: electrics, acoustics, amps, effects and recording. All the best guitar products selected from the Namm show for you. The British maker launches a non-signature electric line made in the Czech Republic. We give the MA-2 the full Guitarist test. Quick Test: Coopersonic Tubecleaner, Vox AC1RV, Mackie Onyx Black Jack & Electro-Harmonix Neo Clone.